House with 3 Bedrooms and 2 Bathrooms near the beach and the mountains. CA OLIVARES is a typical Valencian house from the late 19th Century, located in the old town of L’Alqueria de la Comtessa, a peaceful village 3 kilometres away from Gandia and Oliva beaches and at the foot of the La Safor mountains. It preserves an old Valencian house quality: its wooden beams from Flanders, its high ceilings, its thick walls, the paintwork, its patio, and furniture that evoke its past. Hi-fi/stereo. 2 TVs, DVD player. We are Elvi and Juanma and…we love our house. It’s Elvi’s family since its building in 1898 and we have set it aside for rural tourism since 2003. Since then, we haven’t wavered in our endeavor to improve and equip it for you. We want to help you to see through it; you discover the colours, interesting spots, smells and flavors of our Mediterranean sea and the unknown paths, routes and mountains of its surrounding area. You will enjoy a peaceful comfortable cozy clean and well-equipped accommodation. We treat it with great care as it was our own house. Built by Pedro Castello and Elvira Castella and inherited by his daughter Elvira Castello who married Paco Olivares, a well-known cattle merchant from Murcia, from whom the house takes its name, as it is a unique surname in the town. In 1999, the daughter of this marriage, Elvi Olivares, is the current owner. It has belonged since its construction and for three generations to our family. We have a special affection and attachment and we want to preserve the essence of his time with the comforts of our time. The strengths of Ca Olivares, based on our guests´ feedback, are: comfort amplitude cleaning equipment The decor and condition Its location, 3 km from the beach and close to mythical mountain trails of Valencia. It parks without problem in the street of Ca Olivares. The day of arrival there will be plates forbidden to park in the same door of Ca Olivares. You can leave the car there, to download the luggage. Ask for high chair for child if needed. Fabulous house, warm welcome, comfy beds, a real home from home. Warm welcome....chocolate cake and water....so nice. Una casa típica valenciana cuidada hasta el más mínimo detalle. Pasamos una semana allí con la familia. Los propietarios Juanma y Elvi son encantadores. Sin duda volveríamos a repetir. La casa es muy acogedora y no le falta detalle. Los propietarios son muy atentos, nos recibieron con un rico panquemao. Hemos pasado tres noches con nuestra hija de una año y medio. La escogimos para pasar el fin de semana y celebrar nuestro aniversario de boda con nuestros dos hijos. Fue todo un acierto. No le falta detalle, es cómoda, bonita, limpia y súper bien equipada. Te transporta a otro tiempo, pero con todas las comodidades. Saludos a Elvi y Juanma que nos atendieron fenomenalmente bien. This summer we (a couple with two children of 10 and 12) spent two wonderful weeks in Ca Olivares. Our very first view exceeded our expectations (and that was while we had already seen nice pictures on the Internet!). What a beautiful house! 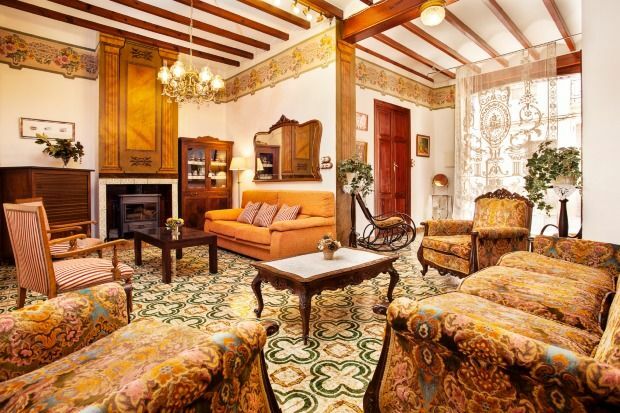 Splendidly and carefully furnished in old-Valencian style. We always found more things to marvel at and we discovered new details during our stay. Very special. The house is spacious, deliciously cool and has three bedrooms and two bathrooms (one pink and one blue!). In addition, there were a large living room, kitchen and patio. In the patio the jasmine tree was flowering and gave off a lovely and unforgettable smell. The house had everything that a family like ours could possibly need, including camping chairs and a beach umbrella to use on the Piles beach. House owners Elvi and Juanma are extremely friendly and welcoming. They had made a chocolate cake when we arrived and they had already bought some groceries. In addition to the folders with information on the local sights and dining tips, we also received regular Apps suggesting parties, good beaches, nice villages, affordable restaurants and handy parking places. This really contributed to what turned out to be a very various holiday. Another big advantage of Ca Olivares is its location. We went to the city of Valencia three times to visit la Ciudad de las Artes y las Ciencias, el Oceanografic, el Mercado Central and la Catedral de Valencia as well as we also cycled through the Jardines de Turia. And we visited el Castillo de Xátiva besides the palm plantation of Elche, Gandia and Oliva and we swam (Piles, Gandia) and did some snorkeling (cala de Granadella, cala Les Rotes). All in all, a wonderful holiday in a house and location we are not going to forget and that we will certainly return to! Hemos estado alojados dos noches y la experiencia ha sido maravillosa. Los dueños, Elvi y Juanma, te ponen todo tipo de facilidades para que tu estancia sea agradable. Se preocupan en todo momento por que no falte de nada (leña, recomendaciones...) y lo hacen con un trato personal y educado. Y encima te hacen un bizcocho de bienvenida! La casa es muy bonita, te traslada a años atrás pero con las comodidades de hoy en día. La decoración está muy cuidada y las estancias son amplias (habitaciones, comedor, baños y un patio para desayunar al sol). Nos quedamos con ganas de disfrutar de lo que parece ser una terraza en la ultima planta de la casa. Una experiencia sin duda para volver a repetir. The City of Arts & Science with the Oceanographic (Aquarium), Hemispheric (IMAX cinema and digital projections) and “Príncipe Felipe Science Museum”, just as the “Bioparc” (a new generation zoo) in Valencia, “Terra Mítica” and “Terra Natura” theme parks in Benidorm, etc. Get to know the beaches in Gandia, Oliva, Miramar and Piles (3km) where you can enjoy water sports and natural beaches such as l’Ahuir and Terranova. Visit the Ducal Palace and Collegiate Church in Gandia, Xàtiva Castle and its old part of town, Santa Maria de la Valldigna Monastery in Simat and by all means Valencia City. Go hiking through the different signposted routes that you will find in our region, bicycle touring on the old railway track Gandia-Alcoi, climbing the “Peña Roja” rock in Gandia, windsurfing at the “Mar I Vent” School in Piles, rent a boat at the yacht club (Club Náutico, Oliva) and go on horse riding excursions (Picadero Los Robles, Gandia). Throughout the year, “fiestas” are celebrated such as Fallas, in Valencia City and Gandia, or Easter as well as the many other celebrations taking place throughout the year in the thirty different local regions.